1. In 2017, the Chinese New year will be celebrated on Saturday, January 28. 2. It is a 16-day festival, starting on the last day of the Chinese calendar year and ending on the fifteenth day of the first month of the Chinese New Year. Note that it is also the longest festival in the Chinese calendar. 3. The dates of this festival vary; however, it always falls between 21 January and 19 February. 4. 12 animals, 12 different Chinese New Year Names: surprisingly, each year of the Chinese New Year calendar is named after an animal that is associated with the Chinese Zodiac. The Dragon and the Rabbit are important to the Chinese New Year. 5. Here is a list of all the twelve animals in order from 1st to 12th: the Rat, the Ox, the Tiger, the Rabbit, the Dragon, the Snake, the Horse, the Sheep, the Monkey, the Rooster, the Dog, and the Pig. 6. The Chinese New Year of 2017 will be the year of the Rooster. It will be 4715th year on the Chinese Calendar. 7. In recent years, China Central Television Station broadcasts the Spring Festival party, which is an essential viewing entertainment for families during the evening. 8. It’s also a myth that the people born under different signs have characteristics that are affected by the animal for that particular year. 9. Red paper strips known as “Chunlian” are used to decorate houses. These strips contain messages that convey good luck and health for the family in the New Year. 10. The Chinese New Year is a festival that is centuries old and has a lot of significance attached to it. 11. Red is the chief color of the festival and it is also prominent in Chinese culture and traditions. It is also the color of choice for decorating windows and doors with paper-cuts and couplets. 12. The evening before the first day of the New Year is a time for the Chinese families to gather over dinner. The dinner is aimed at facilitating the reunion of the family members that are usually busy during the year and/or are working in some other regions of China or abroad. 13. Cleanliness plays a significant role in the upcoming of the New Year and Chinese families take great care in cleaning their houses and properties to welcome the upcoming New Year. 14. Cleaning is also believed to welcome the incoming of good fortune and expelling of any ill-fortune that might be existent. 15. The biggest celebration of the Chinese New Year that takes place outside China is in San Francisco, U.S.
16. Korea, Japan, and Vietnam also use the same Chinese lunisolar (a calendar in many cultures whose date indicates both the moon phase and the time of the solar year) calendar. Why celebrate the Chinese New Year? Legend has it that the beginning of the Chinese New Year is associated with a mythical devil called the Nian. Nian would eat children and villagers. Villagers were always looking to get rid of him but couldn’t find a solution. One fine day, an old man appeared before the villagers assuring them that he will expel Nian from their village. The old man used red papers and fireworks to ward off the devil. Since that day the villagers understood that red color is a deterrent to Nian and henceforth they would use red paper cuts and red lanterns to decorate their houses and lit fireworks on the occasion of the New Year. How it is celebrated and where; and what are its other names? 17. Chinese New Year is a major festival in countries that have large Chinese population including Mainland China, the Philippines, Vietnam, Mauritius, Malaysia, Indonesia, Cambodia, Thailand, Singapore, Macau, and Hong Kong. 18. Some countries with a sizable Chinese population add a statutory holiday on the following work day when the New Year falls on a weekend. Yes, the festival is an important day of the year. 19. The Chinese New Year is known by different names in different regions. Some of the names of this festival are – “Chinese New Year”, “Lunar New Year”, “New Year Festival”, and “Spring Festival”. 20. Buying new clothes and shoes, symbolize a new start. 21. Cutting hair on the Chinese New Year is considered bad and hence people groom themselves before the New Year. 22. It is also a good practice to pay off all debts outstanding before the New Year. This brings good luck and good fortune for businesses as well. The idea is to begin the New Year with a lot of energy and good wishes from your dear and near ones as well as business associates. 23. The decorations used to adorn in the home from the past year are also burnt before the arrival of the New Year. Yes, nothing that will clutter the space is left unattended. 24. The Reunion Dinner, named as “Nian Ye Fan” is the biggest event of the Chinese New Year. What food is served for the reunion dinner? 25. A dish made up of special meats (pork, chicken) and fish is served to the Chinese families as the main course during the special reunion dinner. Other Christians in the U.S. and other countries eat a comparable form of this dinner which is usually the Thanksgiving dinner and Christmas dinner. 26. Number eight (8) has special consideration in Chinese tradition and culture. This is why 8 individual dishes are served during the sumptuous dinner. However, if someone has died during the previous twelve months, they serve only 7 dishes. 27. They also serve noodles that are uncut and are as long as they can be made. Uncut noodles represent longevity and long life, which again is a signal of prosperity. 28. A popular Chinese phrase – “may there be surpluses every year” brings to attention the good intentions of the Chinese is association with the time they are to experience ahead in their life. Thus, they do not eat the fish completely and store the remainder overnight. 29. The meat-packed jiaozi dumplings is among the top most popular food for the occasion. However, it is more popular in northern China than in the southern part of the country. 30. New Year’s cake is another popular dish that is served in Eastern China. It is made up of glutinous rice flour and some sugar. 31. Red envelopes (“hong bao” in mandarian) containing cash are received by young people from elders instead of gifts. The amount in the envelope is always even and it must not be completely divisible by four because number four is associated with death, which is unwelcome in the Chinese culture. People from other nationalities generally exchange gifts during the festive season like on Christmas in the U.S.
32. 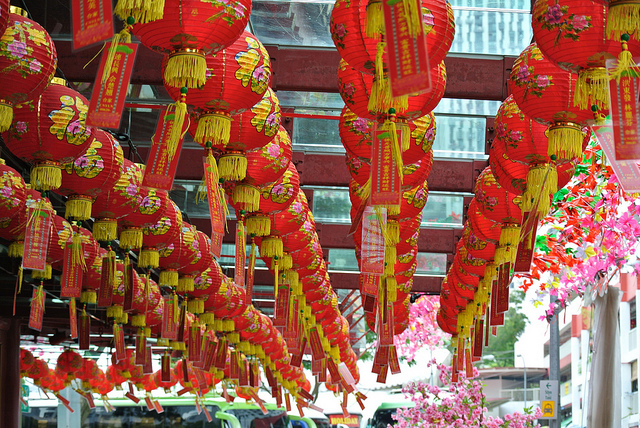 The last day of the Chinese New Year, the 15th day of the first month is the Lantern Day. People walk on the streets with paper lanterns in their hand. They believe this would bring good luck during the year.